What Does the Job of a Licensed Electrician Entail? The role of an electrician is defined as any skilled tradesperson who repairs, designs, installs, or maintains electrical systems or products used in homes and businesses. They can work indoors or outside, ensuring that the equipment, lights, and appliances continue to operate safely. There are different specialties that an electrician can be competent in, including residential and commercial. Generally, electricians work remotely, travelling to the site they are needed. They can be inside finished buildings or working in those that are being renovated or under construction. They may also be outside. They may have a lot of space or be in a cramped area, and the working environment will often have live wires and can be quite dangerous. Jobs for an electrician are available year-round. Some may have a typical 40-hour work week, while others may also work on-call. Independent contractors may have a varying schedule, being quite busy some weeks and only working a few hours the next. As an electrician, you can expect to earn anywhere from $20 per hour to upwards of $50 per hour depending on your position and experience. 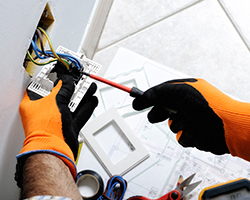 If you’re looking to hire licensed electricians to work for your company, using the services of professional employment agencies in Toronto such as Winters Technical Staffing can help. With over 45 years of experience in the staffing industry, we can help you find the right people using our knowledge, expertise, and resources. The role of an electrician is defined as any skilled tradesperson who repairs, designs, installs, or maintains electrical systems or products used in homes and businesses.